THE NATURAL HAVEN: Is regular trimming necessary (aka my hair will not grow)? Is regular trimming necessary (aka my hair will not grow)? I found this fascinating bit of information on SofullSista, it is an excerpt from Chicoro's book Grow It! "[Break point] The point at which your hair always breaks is the point at which you may need to change your routine....Think back to the longest your hair has ever grown. Even if your hair is still at this length, if it doesn't grow any longer this is likely to be your break point." I find this paragraph very fascinating because it is scientifically accurate (even though Chicoro was writing based on observation and not science). In order for hair to gain length, it must grow faster than it breaks. Let me repeat that, In order for hair to gain length, it MUST grow faster than it breaks. Fact: Is regular trimming necessary? The best science points to yes being the answer. The reason why hair reaches the critical point is because the cuticle layers gradually become thinner. This leads to easier breakage and split ends. Some people CAN grow very long hair without needing to trim (Example Teri of tightly curly). However, remember that we are all individuals. If you have experienced a break point then you are probably not in this group. Regular trimming means a snip every 3,4 or 6 months, whichever one helps you find less and less split ends. Fact: Why does regular trimming help hair grow longer? Remember the crucial balance - In order for hair to gain length it MUST grow faster than it breaks. 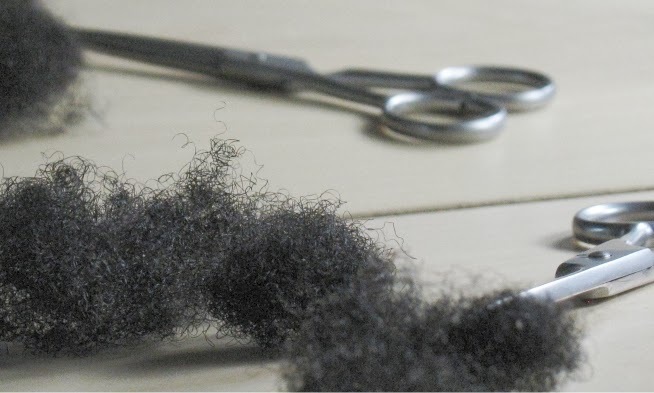 Trimming does not grow hair but getting rid of thinned down or absent cuticles may help to stop or slow breakage (meaning hair can return to growing faster than it breaks) . Fact: What else can you do to pass the break point? Chicoro suggests changing routines and trying to strengthen the ends of the hair. (taken from SofullSista). I think this is good advice. If your hair is stuck at a certain point then the methods and skills you have are good enough to keep it at that length. If you want to move it along then you have to change what you are doing. The main change should be along the lines of being gentle. Hair breaks because of applied force. Be conscious whenever you touch your hair, are you being as gentle as possible? Really be conscious, are you pulling your hair when styling it? When you apply styling products are you being as gentle as possible? I have seen a significant jump in my hair growth/health since incorporating regular trimming. I have fine/thin hair so they may have something to do with it, i find those with thicker hair can get away with not trimming/not so often. I'm generally a proponent for minimizing trimming, but I have to agree with this post. If the hair is stuck at a certain length, it may be time for a trim if you want to pass that length. Damaged ends can beget more damage. I'm not gentle at times I have to work on that.I have not trimmed since december and I'm curious to see if it has continued to grow since at least april. I noticed that I kind of have the same length since about april. Very interesting. Great post. I've been stuck at the same length for aaround a year now. I trim regularly so I have to figure out what else I can change in my routine to help get past this point. Interesting scissors, you have as the image. How do they work? Oh can I make a request. Can you do a post on the hair's F-layer? I'm trying to take better care of my ends, so I'm really wanting to understand this part of my regemine. First, for me it seems that if I trimmed my hair at the point where it seems to thin out or change shape from the rest of my hair that's twisted(in thickness) I'd be cutting more than what was necessary? or getting a hair cut basically, even in the diagram it's a lot of hair. Secondly, I once read that we should twist our hair to the ends, twirl, and pull the ends outward to feel for rough thinning ends and that's where you should trim. but I don't know if crispy dry feeling ends is a sign that they need to trimmed, or sealed more? What do you think about that? I seem to be on a schedule of trimming my ends every two months because the ends start to feel a litle crispy? Chan - I am not a fan of the crispy ends method because sometimes perfectly fine hair can feel crispy if it is dry or conversely if it has alot of product. I think hair length is important. Generally when hair is getting to midback it will begin to taper naturally. However if hair is shorter than this and well mentained, then tapering really should not be happening. I think many times we as women are hesitant to cut a lot of hair (especially when we are trying to grow long hair). Sometimes we need to cut 2 inches but we are only willing to sacrifice a quarter. I think in this scenario the only effective method to gain length would be to actually find the split ends and cut them off individually. Painstaking work but necessary if you want to keep the length, get rid of the split ends and continue to grow the hair. wowser what a typo on maintained! Any ideal length of hair to be trimmed and how often? Thank you for sharing this article!